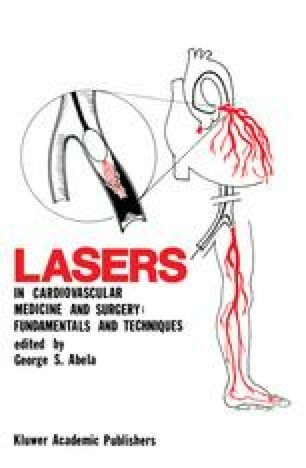 The effect of laser impact on the arterial wall using various continuous wave (CW) lacers is similar. The primary mechanism is the coversion of light energy into hear energy within the atheromatous plaque. This leads to plaque vaporization with surrounding thermal coagulation. The efficiency of this process is related to the amount of deposited laser energy as well as the plaque properties (e.g., thermal conduction and absorption qualities at a specific wavelength). For example, the CO2, laser at 10,600 nm is highly absorbed by water. Because water is a major constituent of tissue, the CO2 wavelength is rapidly absorbed at the surface of the tissue, with little beam scatter deep within the tissue. Thus, the effect of the laser is localized at the site of beam deposition. Consequently, the CO2 laser serves as a cutting device that simulates a surgical scalpel. The Nd:YAG laser at 1064 nm is not well absorbed and the beam is widely scattered within the tissue, which results in a wide area of thermal coagulation.